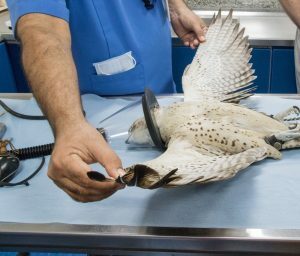 The Abu Dhabi Falcon Hospital, the first of its kind in the world, was established in 1999 to treat, study and rehabilitate these beautiful birds. 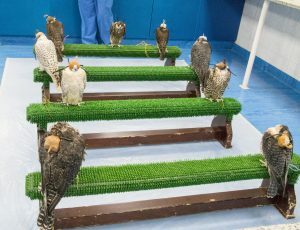 At this unique hospital, the falcons and peregrines-some costing as much as a luxury car, are cared for by a team of veterinary staff from all corners of the globe. Ironically, all the falconers are men, even the receptionists, but the hospital is headed by a female veterinarian. And a Westerner at that, with Dr. Margit Gabriele Muller as executive director. What started out as a small endeavor with trust and respect not easily won or given in this tribal and patriarchal society, to being the cradle of modern falcon medicine in the 21st-century. So critical is the falcon hospital, two previously unknown diseases have been discovered here. Under Dr. Muller’s tenure, she has seen the lifespan of falcons increased from 12—15 years to 18—20 years, all by encouraging the falconers that regular check-ups were essential to their pets. Even the Emirati royal family relies on Dr. Muller’s expertise for their own falcons. From wings, talons and beak trims (while under anesthesia), to full-service boarding during the May-September molting season, these birds get the VIP treatment. The hospital provides a separate exercise building for flying laps, complete with air conditioning, a spa, small pools, and an area for soaking up some rays with feathered friends. Here, they have the life. 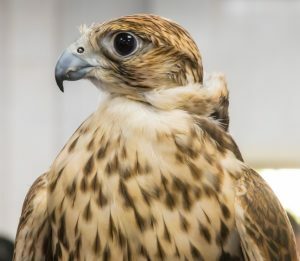 The Falcon World Tour allows the visitor to learn about Bedouin desert history, while these birds of prey perch on your gloved hand for belly rubs. Where else can you get this up close and personal with a falcon? What secrets of the desert must they know? The hospital recently opened its latest venture, the 5-star Avian Hotel, for short and long-term stays for falcons, and now parrots. Each spacious room is designed for free movement and flight possibilities. Completely equipped with toys, climbing trees, as well as a music system for avian enjoyment during the day. Here in the UAE, late April already sees temperatures approaching triple digits, enough to ground the falcons for the summer. With the molting season just days away, feathers start shedding and flying becomes lethal. Even the loss of one flight feather can destroy their balance, making a crash on impact inevitable. With speeds of more than 150-miles per hour, it’s not a pretty sight when a falcon crashes or flies into a car. Add that to the white-out conditions, sneaky desert sandstorms that rage without warning, and flying becomes treacherous, both aviary and mechanical. When not taking treatment at the hospital, these birds are also full-fledged globetrotters. 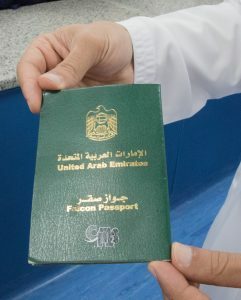 So revered by the Emirati, each falcon has issued their own passport for international travel. The passport shows the bird’s picture, pedigree, and vital statistics, along with a picture and name of its owner. Between the periods 2002—2013, 28,000 falcon passports were issued, which combats smuggling of the birds. With their green U.A.E. government-issued passports, the falcons and peregrines fly with their owners, usually in business or first class. They rarely touch a coach seat, and no cargo hold ever for these beloved pets. We should all be so lucky flying first class on Emirates or Etihad. What sets them apart from other predatory animals is the fact that falcons can be trained to deliver their prey without killing it first. What they must have seen soaring high above the desert. Way before they officially held passports, they were always travelers. So entwined with Middle Eastern culture and history, UNESCO included the sport of falconry in its representative list of the intangible cultural heritage of humanity. In the UAE, the image of the falcon is everywhere, even on bank notes. 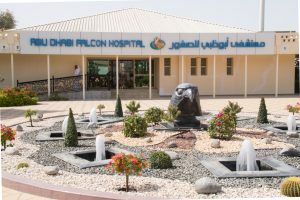 The falcon hospital is a not-to-be-missed experience when in Abu Dhabi. Book the Falcon World Tour to discover this fascinating one-of-a-kind hospital, learn about Emirati, Bedouin culture, and these beloved birds of prey. To avoid disappointment, book directly at falconhospital.com well in advance as tours sell out quickly.